A number of weeks have passed since the Nomad returned to Joscar Smash Repair and Restoration so I thought I would slip out and check on the progress. 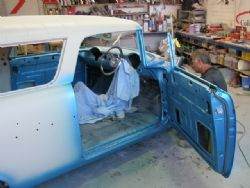 I caught up with Brian at the Camden Car Show and he gave me an update so I was keen to see the progress. I had sent off all the brackets for the bumper bars to be blasted so when I got them back I spent a few nights in the garage covering them and myself in POR15. These made the journey to Revesby with me and it’s always great to walk in and see someone working on your car. Joe was hard at work fitting a painted patch panel over the round air duct holes in the firewall and they looked a treat. 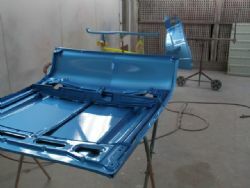 The panels have been on and off a few times to test the alignment before being squirted in paint. 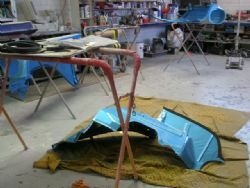 Currently they are in the paint booth and have been painted on the inside or underneath, depending on the panel. The inside of the doors and the jambs have received similar treatment and every time I see the colour on another piece of sheet metal I like it more. I can’t wait to see the whole car painted. Brian and Joe had a chat and told me the colour is an unusual one and a bit tricky to work with. They applied three coats to the inside of the fenders and in the booth it looked good but once exposed to sunlight you could make out thinner areas in the paint and any tiny blemish stands out big time. It will test their skill on the outer panels and before any clear is applied I have no doubt it will be rolled outside to check the colour and coverage consistency. 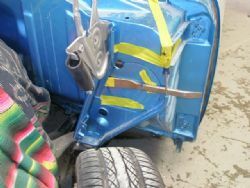 The radiator support, bottom splash panels, bonnet and a couple of other bits were in the booth while the guards were hanging up in the workshop after they had been painted. The car has been blocked back and primed again and once they are happy with the preparation and rehang all the panels it will get squirted all over. It will be interesting to see how the white is offset by the blue but I suspect it will look stunning.